Hello! I had a chance to do some shopping and have lunch with my friend Stacy this week. Of course, our shopping included a trip to a local scrapbook store and Joann's. I finally gave in and bought my first Unity stamp set, Pixie Lane. We both loved the set and when Stacy told me that one of the cottages was what she envisioned when she started The Scrapbooking Cottage, I just knew that I had to make her Christmas card with the image. I used Mercy's Tuesday Sketch #48 for my layout. I loved the long sketch (my card is 4" x 8") so that I could show off more of the fun Eskimo Kisses patterned paper. 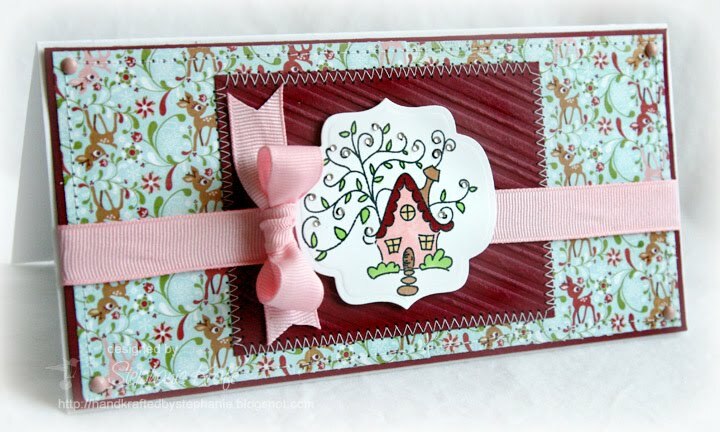 I dry embossed the Scarlett Jewel panel with Candy Cane Stripe embossing folder and added tiny rhinestones all around the leafy vines. Accessories: Labels Nine Nestabilities (Spellbinders), Candy Cane Stripe embossing folder (Provo Craft), Markers (Copic), Taylor's Tiny Twinkles (Taylored Expressions), Brads, Ribbon, Foam tape, Thread, Sewing machine. YIPPEE!! I love it! Great job with the sketch and that cottage is sooo cute! another fabulous creation, stephanie! that's it...i have to have you as a guest designer! be looking for an email from me this weekend! thanks for playing along with my sketch for this week, you did an amazing job! Such a darling card! Glad you gals had a fun shopping spree! Just so gorgeous!! I love that Image!! what a stylish card!! stunning! !